As the families prepared last weekend to mark the 40th anniversary of the atrocity -- carried out by unionist paramilitaries but falsely blamed by the police on the IRA, some relatives launched a civil case on the basis that the handling of recent investigations has added to their pain. Fifteen people -- including three women and two children -- were killed in the no-warning UVF bomb attack on the bar in North Queen Street in Belfast on December 4 1971. Seventeen people were injured. At the time, it was claimed by the RUC that an IRA bomb had detonated accidentally inside the bar. In a report released in February, the Six-County Police Ombudsman found there had been “investigative bias” by the RUC in the original investigation into the atrocity. However, this conclusion was only reached in the second draft of the ombudsman’s report into the investigation. The first report was shrouded in controversy after the ombudsman found there was no wrongdoing on the part of police, causing outrage among victims’ families. It later emerged that the report had been altered before publication, and without explanation. 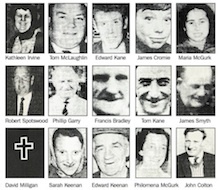 Last weekend, the families of those killed, along with survivors of the bombing, remembered the victims in a Mass at St Patrick’s Church in Donegall Street. Among those attending was North Belfast man Ciaran MacAirt, who spent a number of years researching secret military-intelligence reports that helped expose the cover-up around the bombing. His book, which shows that disinformation was sanctioned and encouraged at the highest levels of government, is due to be published early next year. “Disinformation is central to the state’s cover-up of the atrocity so I trace its dissemination through governmental, RUC and British military files as it was drip-fed into the media and into the public consciousness,” he said.